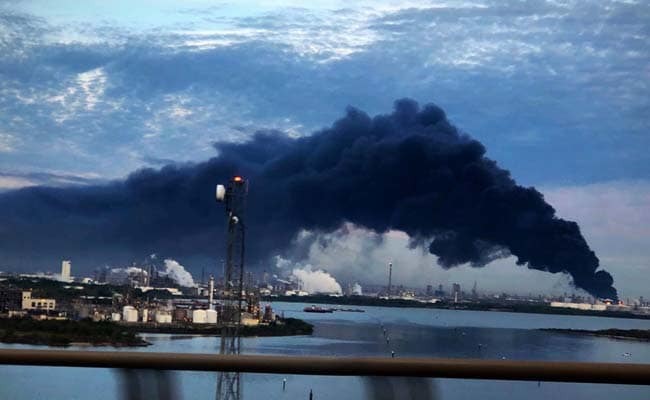 A massive fire at a fuels storage company along the Houston Ship Channel may burn for two more days, an official said on Monday as the blaze spread a plume of black smoke across the city, shutting schools in two nearby communities. The fire began Sunday morning in a giant storage tank containing naphtha, a volatile substance used to create octane-boosting components of gasoline. No injuries were reported from the fire but nearby residents were encouraged to remain indoors. The entire city of Deer Park, Texas, a Houston suburb, was told to shelter in doors all day Sunday. The order was lifted Monday. “It’s going to be probably two days,” said Ray Russell, communications officer for Channel Industries Mutual Aid, which coordinates firefighting departments from ship channel plants. “It’s going to have to burn out at the tank,” Russell told reporters at a mid-morning news conference. No employees at the facility were missing and no injuries were reported, Intercontinental Terminals Co (ITC) the operator of the storage facility, said in a statement. The risk of explosion was “minimal” but ITC was attempting to drain naphtha from one of the burning tanks, it said. Regular gasoline for prompt delivery on Colonial Pipeline traded at a discount of 4.50 cents a barrel to the futures contract on Monday, up a quarter-cent from Friday. A leak in the naphtha storage tank ignited and flames spread to nearby tanks overnight, ITC reported to a Texas regulator on Monday. Its report did not say what caused the leak to catch fire. School officials in Deer Park, population 32,000, and nearby La Porte, Texas, with about 34,000 residents, suspended classes and told employees not to report to work on Monday. Seven tanks containing naphtha and xylene, petrochemicals used to make gasoline and base oils commonly used as machine lubricants, were burning, ITC officials said. On Monday, a tank containing Toluene also caught fire. Toluene is used to manufacture nail polish remover and paint thinner. The burning tanks are surrounded by other storage tanks within a spill containment dike. Firefighters used a foam fire retardant on nearby tanks to try to limit the fire from spreading. Ships continued to cross the 50-mile-long channel, which is part of the Port of Houston linking refineries and chemical plants in Houston and Texas City, with the Gulf of Mexico. “There has been no affect on vessel traffic other than at the two terminals,” said J.J. Plunkett, port agent at the Houston Pilots, whose members guide ships in and out of the channel. Ship access to docks at the ITC and Vopak terminals was restricted by the U.S. Coast Guard, he said. The Texas Commission on Environmental Quality, U.S. Environmental Protection Agency, and state and local authorities were responding to the blaze, ITC said. The fire was not affecting operations at the nearby Royal Dutch Shell Plc joint-venture refinery in Deer Park, said Shell spokesman Ray Fisher.